Vol. 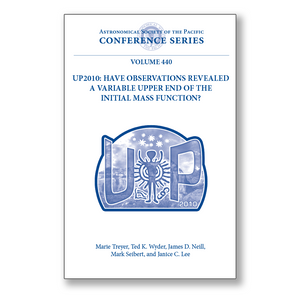 440 – UP2010: Have Observations Revealed a Variable Upper End of the Initial Mass Function? The stellar initial mass function (IMF) is a fundamental parameter that not only encodes the complex astrophysics of star formation, but is also crucial for interpreting the vast majority of observations made in extragalactic astronomy.Therefore, it is imperative to constrain its functional form, and the manner in which it may vary between different environments. These are the proceedings of a scientific workshop that brought together astronomers from the international community to review the ensemble of accumulated observational evidence constraining the massive end of the IMF, and to debate recent work challenging the standard assumption that it has a universal form. Spirited arguments, both supporting and disputing the universality of the IMF, are presented in this volume. A unique aspect of this collection of papers is that it covers a wide range of approaches, from standard methods based on resolved observations of massive stars in the Milky Way and other nearby galaxies, to the more recent work on integrated light observations of star clusters and more distant galaxies as a whole.This volume provides a broad view of the current state of research on measuring the number distribution of high mass stars in a range of environments. It is useful for both astronomers seeking a general introduction as well as active researchers of the topic.